Up to 8 levels of lift with added Hair-Bond Technology! Indola Blonde Expert Bleaching Powder now has Hair-Bond Technology directly integrated into its formulation. Its bond-protecting molecules help to enforce hair bonds and also minimise hair breakage. This means that as well as delivering up to 8 levels of lift, the dust-free formula can also boast very significantly reduced hair damage. 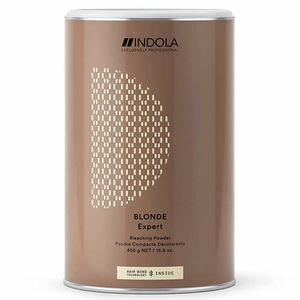 Cream peroxide with a care ingredient that actually smooths the hair as it develops. Optimised for Indola Profession colour and bleach. Available in 1-litre bottles of 2% (7 vol), 4% (13 vol), 6% (20 vol), 9% (30 vol), or 12% (40 vol) solution. 5 shades of semi-permanent toner—no peroxide or ammonia—that gently tones out unwanted yellow from bleached, lightened and highlighted hair.